Cammy Bean's Learning Visions: Instructional Strategies? What instructional strategies do you use to make your content more memorable and engaging? I'm not just thinking about the gadgets and the gizmos that you use or the instructional design "method" behind the process (e.g., ADDIE), but rather the teaching tools themselves. Strategies that help learners connect with and remember the content. "King Phillip Came Over From Geneva Spain"
Remember that one from high school biology? I remember the mnemonic itself, but not all the terms. Something like: Kingdom, Phyllo, C?, O?, Family, Genus, Species. Luckily, these days I can quickly search online for a refresher. I missed Class and Order. And it's Phylum, not Phyllo. But not bad for knowledge I haven't used in 25 years. Wikiquote has a lengthy catalog of mnemonics for a wide variety of subjects, from bartending to home repair. Do you ever develop a mnemonic for a custom course? Or chunk out your content and create an easily remembered acronym to remind the learner of the steps they need to follow? I don't know if I've ever done that. But I've got a mind to try it out one of these courses. I had an interview with an instructional designer the other day, who's developed and led a lot of instructor-led courses. She described getting her learners to "snap things out." She works with the content, chunks it out, and creates snappy rhymes to help learners remember the material. In class, she has the learners walk around the classroom, chanting the rhyme and snapping it out. Things might get a bit silly with all that snapping, but I bet it's effective. How could you do that in an e-learning experience? How do you get your learners to get snap happy? I'm excellent at creating ridiculous rhymes and ditties for my kids; I think I could come up with something interesting for a course. I learned this one from Clive Shepherd's 60 Minute Masters: insert moments of reflection into the course. Create pauses in the activity to get the learner to stop and think; apply the content to their own world; make their own connections. In a recent course, I designed "Think About It!" pages. The course asks the learner an open question. The learner can type their thoughts onto a yellow sticky pad on the screen. These aren't saved for managerial review, they're just a moment in time for that learner. It takes more than rapid regurgitation of content to develop a mnemonic or create a snappy tune. 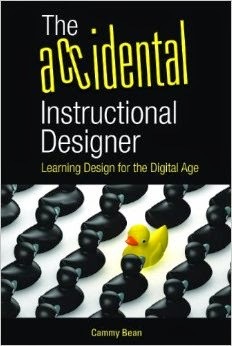 My bet is many eLearning designers don't often have the time to develop creative instructional strategies. But, given the right course, it may be time well spent. What other strategies or approaches could you suggest? Drawing from Dr. W. Thalmeier's research, I try to present concepts repeatedly at different times and in a variety of ways. This helps improve transfer to the long-term memory. Online courses provide ample opportunities to creatively and repeatedly introduce learners to concepts through the subtle, yet effective, use of graphics and/or audio. For example, when I design a course that is trying to teach a far-transfer skill such as a 4-step sales process, I might show the process as a series of simple illustrations or icons. As the learner progresses through the process, they see the next stage light up. The icons would always be on the screen, with the current stage highlighted to indicate where the learner is in the training of the 4-step process. The course might also require the learner to see the 4 steps when they navigate though the training, again exposing them to the 4-step process. Finally, the course content itself would explain that the sales skill requires four steps. Designing courses to repeatedly expose learners to information in a variety of ways is one of the reasons online training can be effective at transferring information to long-term memory for later recall. Laura...thanks for reminding me about reminding learners through repetition! Your example is great. I think this is a really useful technique, especially when you've got an effective graphic (think branding) to expose your learner to again and again. Thanks Cammy. You inspire me to take my blogging to the next level. I have your blog favorited in my facebook profile and it shows me when you have new posts. Your posts are consistently relevant to my work. Thanks for the value you bring to the profession. Ahhh...Facebook as a learning tool! Most excellent. Do you have a public blog at this point? Let me know. I definitely found it was "blogging to the next level" that got me thinking like an instructional designer at the next level. Your profile link wasn't taking me there. Whoops. Thanks for enlightening me about profile sharing. Now the link should work. Cheers.